The genus Primulina is arguably one of the most popular in the gesneriad family, and both species and hybrids are easy to grow in almost all conditions. 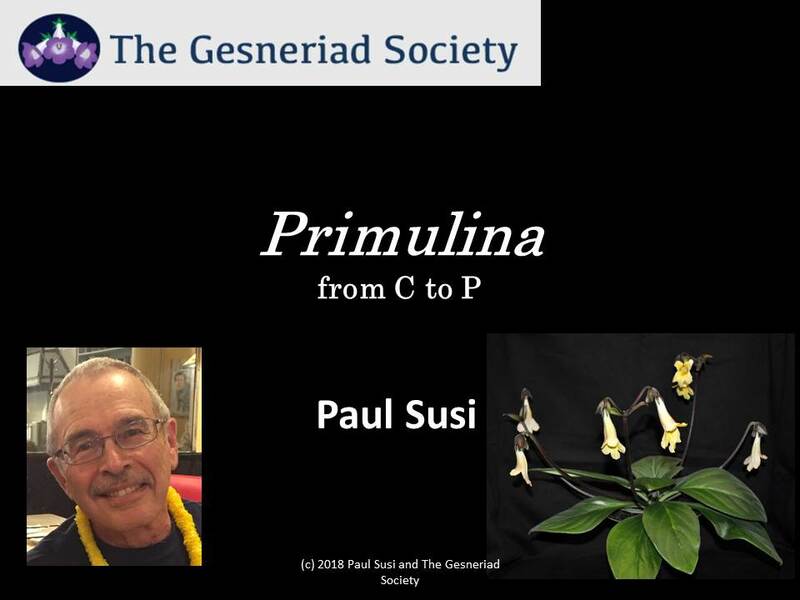 Join us for this 60-minute journey of both time and distance as Paul Susi takes us to a time when Primulina was a genus containing one species and to the areas of China where primulinas are found in abundance. In addition to seeing where primulinas come from, we will learn how the genus gained additional species and how we can adapt our own growing environments to mimic their natural habitat. It’s a lot easier than you think! Paul is a past president of The Gesneriad Society, the current Membership Promotion Chairperson and an active participant in the annual shows of The Long Island Gesneriad Society. He also traveled to China in 2014 with other society members in search of primulinas. This webinar will premiere on January 16th at 7 p.m. ET. If you order the Anytime Viewing (streaming) version after the premiere date, please allow 48 hours for the delivery of your login information and link. Please note that while you can have as many people as you want in the room listening, you cannot share your link with others. The unique login link will only admit one computer.